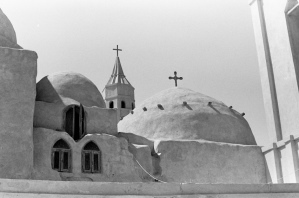 Coptic church in the desert, Wadi Natroun, Egypt (copyright Daniel Kolman,via iStockphotos). The Middle Eastern countries are a paradise of colourful fantasies. Egypt crowns them all. Just spend an evening with Egyptian Christians, and Biblical miracles fade into insignificance when compared to stories of miracles in Egypt today. With each narration of an old or new miracle, the atmosphere becomes more charged. A classic story is about the success of Christian prayers to relocate the Muqattam mountains near Cairo after the caliph had demanded proof that the Christian faith could move mountains, although no record of such a miracle has been found in documents from the period in which it supposedly took place. Another story relates that during a wedding ceremony, a saint (St. Ibscharun) moved a church 600 kilometers to another village. Throughout the centuries, Egypt has witnessed a long procession of patron saints who rose, glittered and vanished, and visions of the Virgin Mary are frequently reported by both Muslims and Christians. Yet when there are tensions between Christians and Muslims, the same religious images can develop into a stream of poisonous lies, embellishments and accusations, often published in the Western press. For the Cairo-based Dutch sociologist, Kees Hulsman, this is a source of great concern. He is married to an Egyptian woman and is a member of the Coptic Orthodox Church. He witnessed the way in which incorrect information and pervasive rumours were leading to a deterioration of societal relations. He and his wife, Sawsan, decided to act, building a large archive of reports about Muslim-Christian relations, published in the Egyptian press. Their efforts have been supported by Bishop Marqus (Coptic Orthodox), Bishop Qulta (Coptic Catholic), Dr Abd al-Mu’ti Bayyoumi, Bishop Munir (Episcopal), and many others. Hulsman concludes that their mission is to ‘[seek] facts in a place where anti-fact culture is widespread.’ Tens of articles are selected and summarised in English by a changing staff, and the resulting Arab-West Report is sent weekly via e-mail to subscribers, including embassies. Sometimes, staff of the Arab-West Report add their own research, and for a fee, the complete translations of original Arabic texts are available. 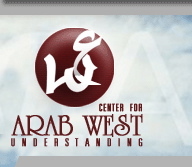 The intention is that in about a year, on the website of the Centre for Arab-West Understanding (CAWU), to be officially launched in May 2006, an electronic documentation centre will be available, making the unique collection accessible to scholars, journalists, diplomats and other interested people. Former Dutch Prime Minister Andreas van Agt, co-chairman of the International Ethical Collegium, has agreed to launch CAWU and its website on 7 and 8 May 2006. Yet now Kerk-in-Actie (Church in Action) of the Protestant churches in the Netherlands has withdrawn its financial support, due to falling incomes from dwindling congregations; at the same time, there were budget cuts in a number of other programmes. This puts into jeopardy the deadline for the Electronic Documentation Centre, which was supported by Kerk-in-Actie, but has not yet been completed. The Dutch Ministry of Development Cooperation is generous in funding projects that encourage inter-religious dialogue, but although Hulsman’s project is low-cost and provides a solid basis of facts for dialogue, it has not yet received any financial support. Development Cooperation prefers to help organisations that have NGO (non-governmental organisation) status. But to obtain this, Hulsman and those supporting him depend on the various departments of the Egyptian government. Some, but not all, Egyptian officials realise how important it is to fight fantasies with fact. For the time being, Arab-West Report functions under the status of a normal company. Relocating to Cyprus, where the rules are much more flexible, would drive up expenses too much. Hulsman notes another problem: ‘This is a private initiative. Financiers find this strange.’ If everything succeeds, it would be the tribute to a lifetime’s work. Hulsman developed a great interest in the Middle East, and a special interest in Christian minorities, during his student days. To understand such issues requires knowledge of Islam, and Hulsman developed a relationship with the Azhar University, the most important theological institution in the Muslim world. As a journalist, Hulsman learnt first-hand how easy it is to write ‘atmosphere stories’, but how difficult it is to obtain reliable facts. An example was the riots in the village of al-Koshh in 1998, when a local priest accused a Muslim family of murdering a Christian. Hulsman was one of the few Western journalists who visited the village. He found little appreciation for his efforts to nuance Western reporting; some media had reported that Christians were crucified. Furthermore, his conclusions that the man had been murdered during a fight amongst a small group of Christians, who were drinking and gambling, was not well received. Hulsman lost clients from Christian publications, particularly in the United States, resulting in a loss of income. Hulsman has also received requests for dramatic stories of persecution, which he was told would benefit not only Hulsman himself, but also the church. The last major riot was in October in Alexandria [this article was written before the more recent incidents in Alexandria]. A video, produced in a church, showed a play in which a young man regrets his conversion to Islam. The actors in this play were all Christian. Members of the Muslim Brotherhood got hold of the video and exploded with anger. The police placed a cordon around the church where the recording was made when they heard a demonstration had been planned. After this, demonstrators attacked smaller churches, and though in most cases their attack was limited to banging on the shutters, the Pentecostal church was severely damaged by hundreds of people. This riot was later reformulated by the American-Coptic exaggeration machine; the number of Muslim demonstrators was multiplied tenfold, becoming thirty thousand, and it was claimed that all the Christian shops in the area were torched. According to Hulsman, who went to Alexandria to look for himself, this claim is not true. Except for the Pentecostal church, where the damage was indeed serious, he and other Christians who went there to inquire saw little damage. The history of the Copts, whose influence has withered over the centuries, plays an important background role. When the Muslims conquered Egypt in the seventh century, almost all the country’s inhabitants were Christian. Christians today only number some eight per cent of Egyptians, and they have seen their influence decrease. Hulsman’s endeavours have been met with little gratitude. A Christian Internet site claimed that he gets a top salary from the Egyptian secret service. Extremist Muslims attacked him on a mini-website. One of the participants cautioned all those advocating dialogue. Hulsman nevertheless remains convinced that machines of exaggeration, whether they are run by Christians or Muslims, need to be sabotaged. He finds personal threats far less threatening than the potential disaster lying in wait for one of the oldest Christian communities in the world.